I don’t talk about this much, but I’m a member of the Cocktail and Spirits Online Writers Group, Guild, Gang, Gigolos, or… well, I forget, really. We’re a non-profit organization that offers educational and cocktail-appreciation events for the general public, via online publishing and live events. It’s through this writers’ gang that I’m going to New York in a couple of months to attend BarSmarts Live (I’ll have more to say about this soon), and it’s also through this group that I receive many of the product samples that I do, as brands attempt to reach out to the public through our group. The Mixoloseum is our online presence. The Mixo front page currently includes a rudimentary cocktail database; you’re free to try it, but the web monkeys are still populating the database with drinks recipes and hammering out the programming of the search engine and the design of the page. The two main areas of the Mixo are the blog and the chat room, and it’s in this latter area where you’ll find us yammering at each other at pretty much any hour of the day or night. One of these events that CSOWG hosts in the chat room is Thursday Drink Night, which happens one night a week at 7 p.m. Eastern time. The guild’s boffins choose a theme, and anyone who attends can create a new drink based on that theme, or can simply sit back and watch the hilarity. You can adapt a classic, or you can go all crazy and build something new. If you’re like me, folks will make your drink, make polite noises, toss it in the sink, and never speak of it again. If you’re actually talented, though, your drink goes up for a vote. If you’re voted Mixolomancer of the Week or whatever, you win a real prize! Sometimes, TDN, as we affectionately call it as we cradle it in our arms and caress its chin, is sponsored by a liquor brand. Past sponsors have included Beefeater 24 gin, Fernet Branca herbal liqueur, Absinthe Mata Hari, and Oval vodka. And sometimes, TDN includes a live component, wherein a bunch of nerds invade a hosting bar, set up laptops in a corner, gank the bar’s wi-fi, and chat with the other geeks in the far-flung reaches of wherever. Back in April, I was in Brooklyn for the Beefeater 24 TDN. Upcoming, we have, well… just stick around. We have some exciting sponsors coming up, including a few well-known brands. This week is an unsponsored night; it’s the first anniversary of TDN and the theme is Tiki. Our extra-special guest star this Thursday will be Tiki author, sartorialist, and raconteur Jeff “Beachbum” Berry. This week’s prizes include a beautiful 50 cm gold Japanese bar spoon (that’s nearly 20 inches, folks, one of the longest spoons you’ll see), six of the newest books from Cocktail Kingdom, a signed bottle each of Obsello and Port of Barcelona gin, and a bottle of Old New Orleans Cajun spiced rum. Beefeater has launched its new style of gin in the United States, Beefeater 24. A production of Beefeater’s master distiller, Desmond Payne, 24 takes its name from the amount of time Payne allows its botanical blend to steep, prior to distillation. B24 features the same blend of citrus peels, juniper, coriander, and other botanicals as its father, Beefeater, but in a different balance of flavor. B24’s not so heavy on juniper, for instance, as daddy is. With B24, though, Payne adds a subtle blend of teas to the mix. I received not one, but two sample bottles this week, and I’ve been slowly putting the new product through its paces. 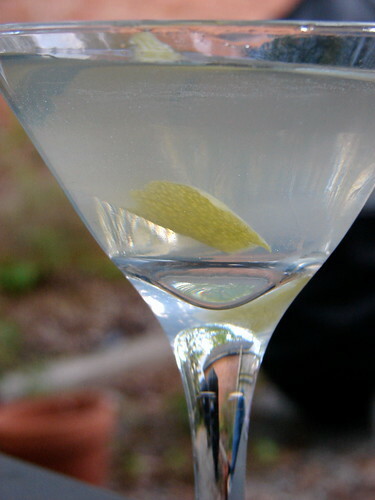 Our favorite gin cocktail is a simple martini; we’ve reached a point where we sip one together every Monday, to take the edge off the start of the week, and also every Friday, to celebrate the coming of the weekend. 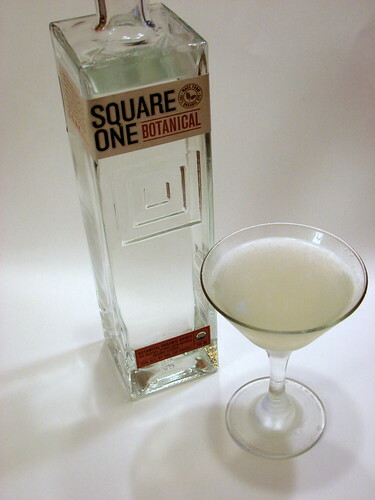 After trying many variations on the gin:vermouth ratio, I’ve eventually settled on a 3:1 mix, sometimes adding a hit of orange or lemon bitters to liven things up. Now, a note about this Lillet Blanc: it’s a French aperitif wine, made by blending a number of wines with citrus peels and citrus liqueurs and then aging it in oak. Tasty simply on its own, it also deliciously complements the Beefeater 24. I would love to try a martini made with Lillet next to one made with vermouth, but I’m already pretty certain that the Lillet is the best choice. The other notable thing about B24 is the beautiful bottle. One thing you can see if you look closely at the photo is the way the glass in the bottle reflects and channels the red of the punt throughout the bottle. The punt is the only area of the glass that’s actually red; everything else is reflection, and it shifts as you move the bottle around in your hand. It’s a lovely effect. Now, since Beefeater 24 is in the midst of launching in the U.S., it doesn’t appear to be available for retail just yet. At least, I haven’t found it yet on the websites of online retailers such as BevMo or Astor Wines and Spirits. I have no firm word on how much it will cost when it’s available; however, a press release at Business Wire says, “The suggested retail price for Beefeater 24 is $28.99/750 milliliter bottle, and $32.99/one liter bottle.” That should put it in a pricing tier with Bombay Sapphire and Tanq Ten, which seems reasonable enough to me, given that it appears aimed at that market. Stir over cracked ice and strain into an up glass. Add garnish. For another take on the B24, head over to Jay Hepburn’s site. A Londoner, Jay reviewed the gin just after its UK launch last autumn and liked it as well. He has detailed tasting notes, which is an area of spirits writing that I’m still working on, as I develop my palate. Note: It’s going to be a Beefeater 24 kind of week around here. Later this week, I’ll be in New York to participate live in something we call Thursday Drink Night (TDN). Every week, some reprobate picks a theme for TDN. A bunch of other reprobates gather in a chat room like the geeks we are to create and discuss original cocktails on that theme. 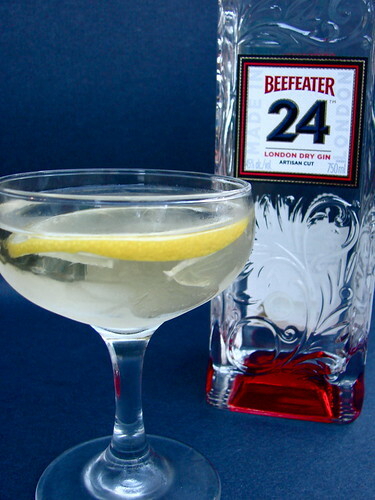 For Thursday, April 30, the theme is Beefeater 24. I hope to review another B24 drink between now and Thursday, so just bear with me a few days if it doesn’t interest you.